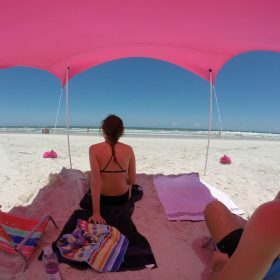 The Otentik sunshade was meant to work with the wind, and is a great beach tent solution for most wind and sun conditions. If you’re having trouble, give us a call! 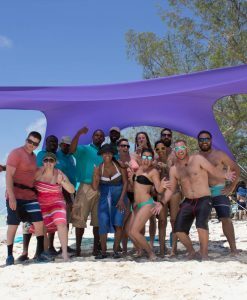 We are available for setup help 7 days/week. 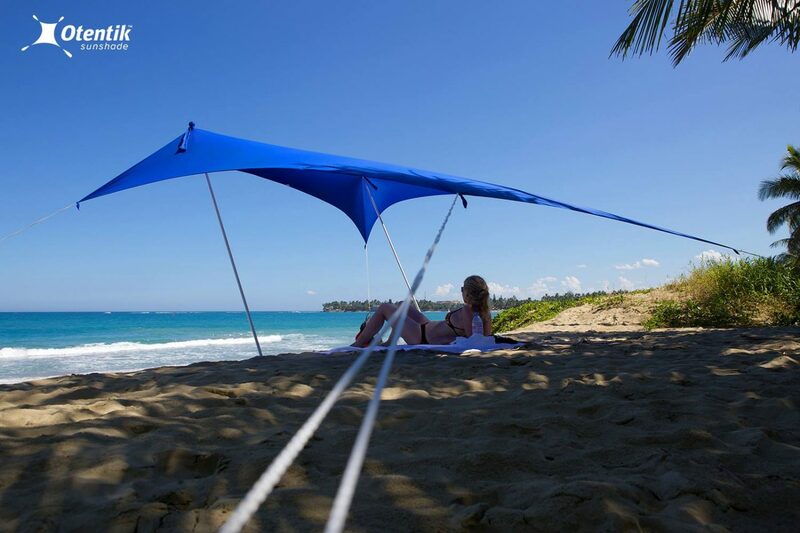 For owners of this portable, lightweight beach canopy, long gone are the days of umbrellas barreling down the beach in an attempt to impale someone. 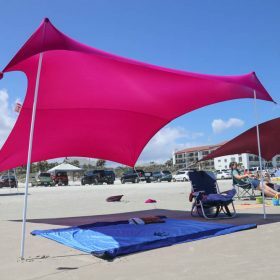 This bebe was meant to work with the wind, and does so very well when set up properly. Like any new product, it can take a couple tries to get it just right…hopefully these tips will help you get a solid set up on your first try. 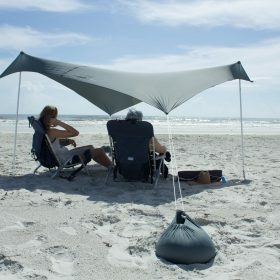 Move the bags away from the sunshade so that there is no slack in the fabric. Don’t worry – it’s super stretchy, amazing Eurojersey fabric! It can handle it. =) Just be careful when you move those heavy bags, so you don’t rip the fabric (especially if they’re a properly full bag weighing 20-25+ lbs!). Do so by lifting from the bottom, and not pulling on the cinched part. You’ll know it’s stretched enough if the fabric and ropes are taut, with the bags pulled out in all four directions. Most importantly, the sand bags need to be full and heavy! 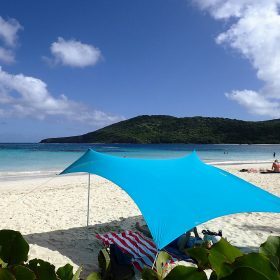 Wet sand is heavier and won’t require as much. 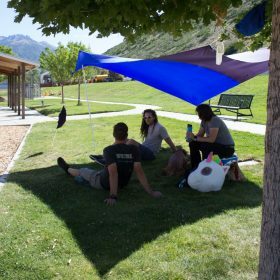 After placing the poles, make sure the bags aren’t sliding towards the sunshade…if they are, just bury or barricade the bags with sand, after you’ve placed the poles in the proper location. The poles should be placed about a foot in from the corner, and close to the windward edge. 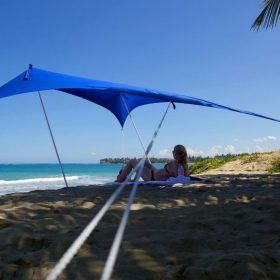 This will help the sunshade to billow up, rather than get pushed down by the wind. Also, you can wrap the pole ‘sleeves’ around the top, where the ball is placed under the fabric. This stabilizes the poles in place, and prevents them from falling. To do so, just wrap the fabric around the top and tuck it into itself. 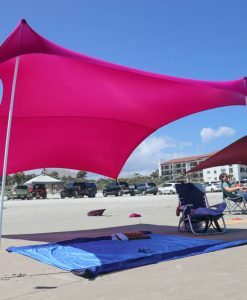 This is how a large should look when setup in high winds. 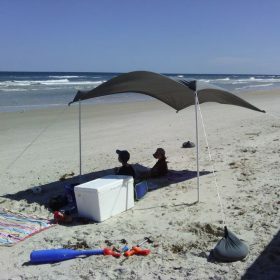 And here’s another example of a medium Otentik sunshade in a decent breeze. 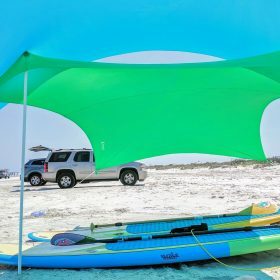 This entry was posted in Otentik Sunshade, Setup Tips and tagged Beach Sunshade, otentik, Otentik Sunshade, Setup Tips.